General musings on recipes, attempts to grow flowers and LDN lyf. What better place to start than scotch eggs? 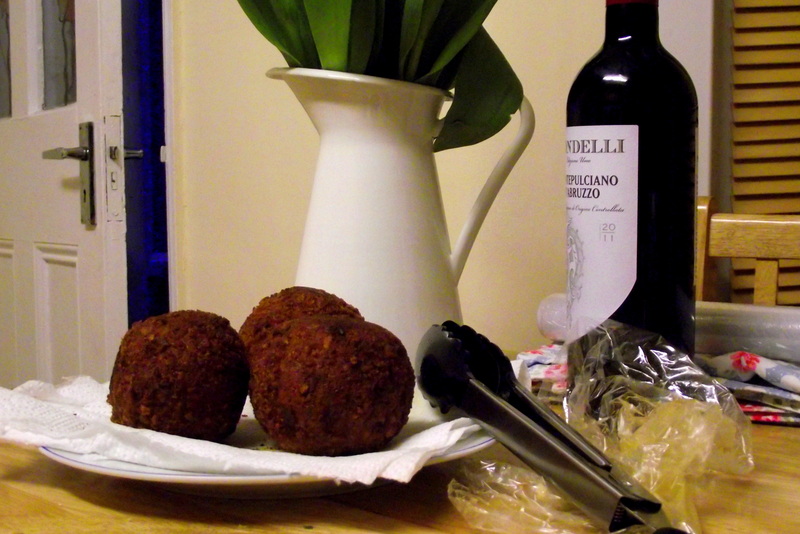 More accurately, chorizo scotch eggs. If you’re a scotch egg fan (and let’s face it, that’s most of us) these will be the best darn things you ever put in a picnic basket. They’re surprisingly easy to make, once you get over the sheer terror excitement of a pan of hot spitting oil on your hob, although they will use almost every bowl you own. Worth it. 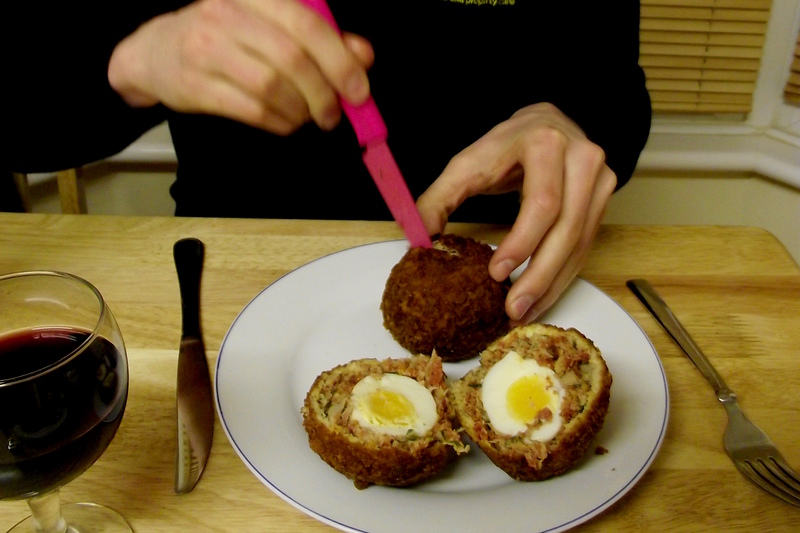 The recipe is based on Felicity Cloake’s Perfect Scotch Egg (who can resist a title like that). I like to put chorizo in most things but if you don’t like it, chill, just leave it out, and the herbs are basically up to you. I’m quite excited about my new herb garden so I shoved everything in there but tbh the most important one is parsley. The one thing I will say is that you might be tempted to skip the second egg/breadcrumb layer – don’t! 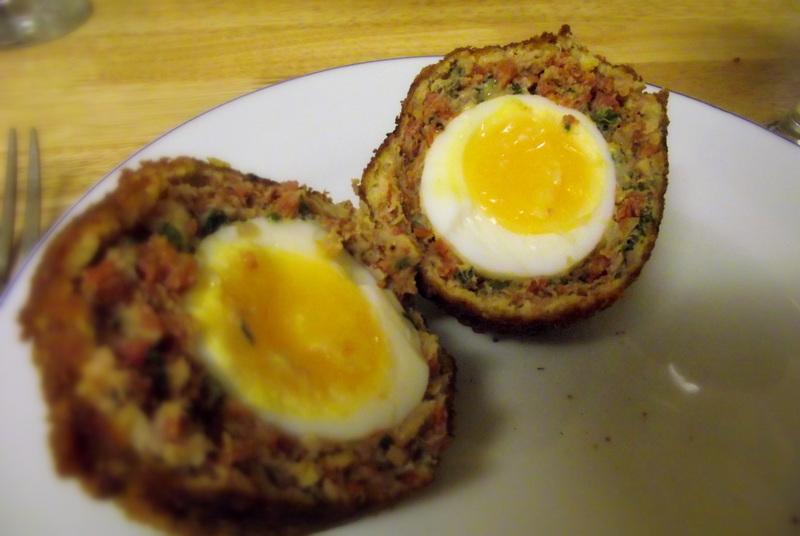 This will take your scotch egg to the next level of crispy deliciousness. Mmm. These are fantastic warm, with a glass of wine for a weekday supper, but just as nice cold on a picnic. Put four eggs into a pan of cold water, bring to the boil and simmer for 5 mins then put straight into iced water and leave them there till later. This will keep your yolks lovely and soft but not running all over the picnic rug. Put the chorizo in a blender and blitz until it becomes lots of yummy meaty crumbs. Squeeze the sausages out of their skins and mix with the chorizo and herbs until combined. Divide into four. Peel the eggs and set up an assembly line of flour, raw egg beaten with milk, and breadcrumbs. Lay some clingfilm on the worktop and flatten one of your sausagemeat balls on it until about 5mm thick, or until it looks like it could wrap around an egg. Roll the peeled egg in flour, wrap the meat around it and smooth all the edges together. Dip in flour, egg, breadcrumbs, egg, and breadcrumbs again. Repeat with the other 3. Take a deep pan and fill with about 7cm of oil – it doesn’t need to completely cover the egg as it’ll bubble up around it. Heat it until 170C, or until a bit of bread sizzles and turns golden when you drop it in. Put two eggs in at a time for seven minutes, turning with tongs to make sure they’re evenly golden. Drain on kitchen paper then scoff the lot. I’ve been threatening to make a scotch egg for ages. As these have chorizo in them, which I also adore, I may give these a go. They look delicious. Thanks! And do, I can’t recommend them enough.